The Ateneo Art Awards: Purita Kalaw Ledesma Prize for Art Criticism is a new prize category under the Ateneo Art Awards banner, launched by the Ateneo Art Gallery in partnership with Kalaw Ledesma Foundation. This award aims to encourage local art writers to foster critical public discussion about exhibitions and artworks, keeping with the mission and vision of the Ateneo Art Gallery to recognize artistic talent and push boundaries in contemporary art practice. 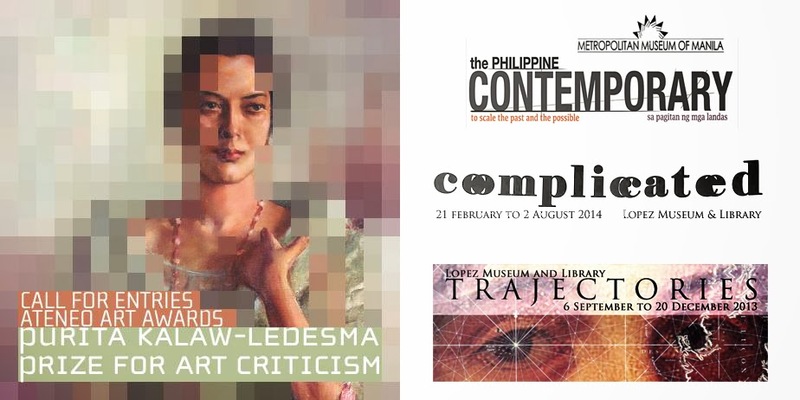 (1) Complicated, ongoing until August 2, 2014 at the Lopez Memorial Museum. (2) The Philippine Contemporary: To Scale the Past and the Possible, at the Metropolitan Museum of Manila, February 2013 to March 2016. (3) Trajectories, 6 September to 21 December 2013 at the Lopez Museum & Library. Visual documentation must be submitted together with the art critiques. Deadline for submission of entries will be on March 31, 2014. 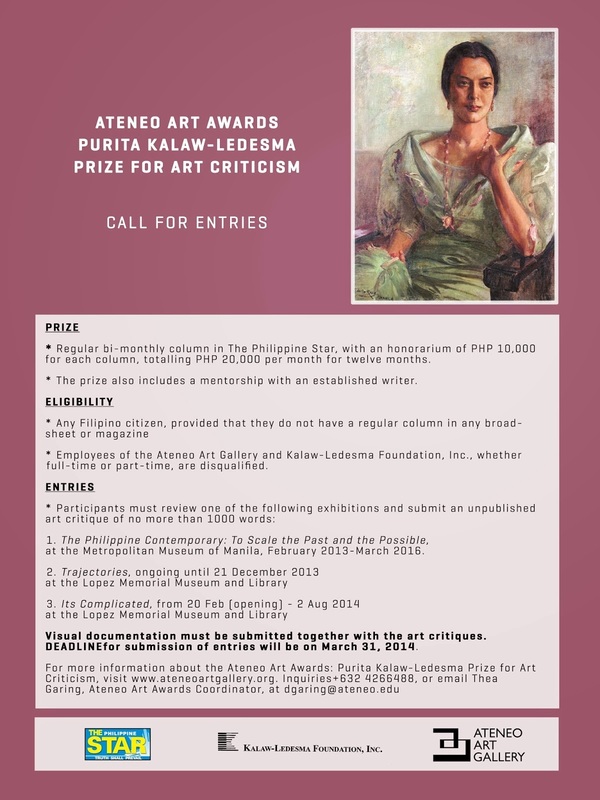 The announcement of the recipient of the inaugural Purita Kalaw Ledesma Prize for Art Criticism will be held during the Ateneo Art Awards ceremony in August 2014 as part of the celebration of Ledesma’s 100th birth anniversary. Please note that copyright of the works of the 3 shortlisted writers (including the winner) shall be held jointly by the Ateneo Art Gallery and the Kalaw-Ledesma Foundation, Inc. The prize is a regular bi-monthly column in The Philippine Star, with an honorarium of Php 10,000 for each column written by the winner, thus totaling Php 20,000 per month for twelve months. The column will be held for a one-year term only from the time that the prize is bestowed. The prize also includes mentorship with an established writer.